Framtidsmässan 2016 is approaching and will take place April 21 at the Munich Brewery in Stockholm. New this year at the Framtidsmässa is a Student Championships in the public sector that will premiere. Media profiles Fredrik Lindstrom and Kristian Luuk are the hosting the competition. 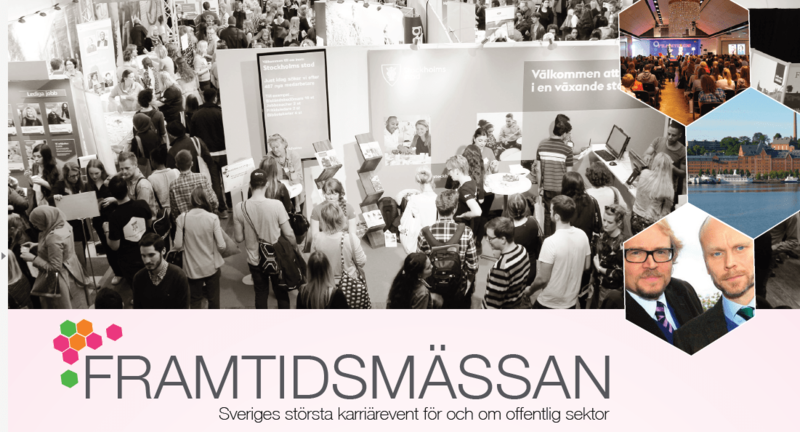 It will be a thrilling competition between students from Swedish universities and colleges about who has the greatest knowledge of the public sector. The competition takes place at the Munich Brewery at the Framtidsmässan 2016 and has two parts. These subsections consists of a questionnaire and a case, and winners are selected in a notable final. Gather a group of 3-5 students and email the team name and email addresses for all participants and which University you are studying at to daniel@framtidsverket.com. Write “Student Championships” in the subject line. When we received the email we will contact you with further information about the competition. You do not need to make preparations before, all information will be given on site. PRICE: Great prizes are promised. The prizes will be presented in advance of Framtidsmässan. Psychological coachning: You can now as apply for coaching by a psychology student either for your self or as a group. Applications for coaching for the next semester is now open. More information on www.psykologiskcoachning.nu. The union board also like to take this opportunity to wish you a merry christmas. Latest issue of et al. is now available! It is now time for the semester’s second and last issue of et al. With this Christmas edition, the editorial team would like to thank for this first year with all your readers. As before you can read the magazine online here, and it will also be available at the After Study Pubs, Café Nian, the Medical Library and the union offices. You can also download the PDF version of the magazine (here). Also, our digital publishingservice Issuu has a free mobile app which works for all operating systems where you can also read the magazine. Comments, thoughts or questions regarding the magazine’s content, work, design and more can be mailed to the chief editor: Matilda Forssberg at etal@medicinska.se. et al. is our union magazine and usually contains at least an article in English. This issue’s article describes the work done to battle Ebola on the ground. In a partnership with IFK Umeå, the Umeå Medical and Health Sciences Studentunion can now offer skiing cards at discounted price to our members. The card which normally costs 700 kr, will only cost 450 kr for members. The card can be bought at our offices (located on the first floor at Kårhuset Villan) during our opening hours (10-13 on weekdays). Denna information riktar sig enbart till dig som studerar till: Sjuksköterska, Röntgensjuksköterska, Arbetsterapeut, Fysioterapeut, Tandhygienist, Tandtekniker, Logoped eller dig som läser Tränarprogrammet. Ärade student! Vi från Umeå Medicinska Studentkår bjuda in dig till att göra en av årets viktigaste enkäter – VFU-enkäten. Den handlar om hur upplägget på den verksamhetsförlagda utbildningen har påverkat dina ekonomiska förutsättningar, din upplevelse av VFU och vad som eventuellt skulle kunna förbättra eller försämra denna.Kort bakgrund:Vid Verksamhetsförlagd utbildning utanför Umeå ges idag en schablonersättning från Umeå universitet på 2160 kr per månad. På en del program är det vida känt att det sällan eller aldrig räcker till att täcka de praktiska kostnaderna som VFU-praktiken och boendet medför. För att dokumentera och undersöka problemets omfattning, innan åtgärder vidtagits, är det väldigt viktigt att så många som möjligt gör enkäten. Antalet svar påverkar vilken tyngd det sammanställda enkätsvaret kommer att ha och om den kommer att tas hänsyn till i diskussioner med exempelvis universitetet. Du är helt anonym i enkäten. Svar önskas i dagsläget endast av dig som studerar till: Sjuksköterska, Röntgensjuksköterska, Arbetsterapeut, Fysioterapeut, Tandhygienist, Tandtekniker, Logoped eller som läser Tränarprogrammet.